The School Motto is ‘Et Comitate, Et Virtute, Et Sapientia’. The motto dates back to the founding of the School in 1882. The words are Latin and broadly translated, mean ‘Comradeship, Valour and Wisdom’. These were virtues highly esteemed by the Romans and are regarded just as highly in a person’s character today. The New Plymouth High School was built on a dominant site over-looking the developing town of New Plymouth in 1882. The New Plymouth High School was built on a dominant site over-looking the developing town of New Plymouth in 1882. The wooden building of imposing architecture first housed a roll of 35 boys and in 1885, after vigorous debate, girls were admitted. Mr Pridham, the headmaster, initially did not agree to co-education classes and the girls were taught separately until lack of numbers led to combined classes in 1887. The girls remained part of the school for 27 years, and held their own academically by winning the Dux prize fifteen times. The roll of the school in those early days was a cause for concern and hovered around 50 for many years. (In 1900 there were 33 boys and 17 girls.) Education was not free and a four pound ($8) fee was charged per quarter. This, despite the school offering scholarships, no doubt reduced enrolments. Education was not popular within the town either. According to the Department of Education inspectors, pupils entered the school inadequately prepared and many left too soon to reap the benefit of a full education. Mr Pridham regretted the lack of enthusiasm for school and considered that for many pupils it was only a work-place alternative, and that the boys in the senior classes found a female teacher uncongenial and were unhappy to be in competition with the girls. The 1900s saw a number of changes which strengthened the fabric of the school. In 1902 free-placed pupils were accepted, Science was added to the curriculum and the building of a chemistry and physics laboratory approved. Public exams were introduced – with some success. Sports became an important part of the school culture, with cricket and rugby teams doing well in local competitions and achieving success in the first college matches in 1907 against Palmerston North and Napier High Schools. A magazine entitled ‘New Plymouth High School Magazine’ (later to become ‘The Taranakian’) was published that year, and 48 candidates sat public exams. In 1909 Science had grown in importance within the curriculum, and also a school orchestra was formed. In the following year the school cadet unit, an activity since the school’s inception, was re-organised and also a course in agriculture was introduced. The roll had grown to 130, with 50 of these being new entrants. The town finally embraced the school. A new era was about to begin. In 1912, after 30 years of service, Mr Pridham retired and Mr W H Moyes took up the reins of headmaster. He was 30 years old. He was a brilliant scholar, sportsman, and an experienced teacher who was born to lead – and lead he did. A uniform was introduced, the school magazine was revived, girls were taught in separate classes in rented accommodation in town, a site for a girls’ school was acquired, and two years later there were two schools: New Plymouth Boys’ High School on the old site and New Plymouth Girls’ High School across the river on Mangorei Road. The boarding establishment was set up, although previously a few boys had been accommodated privately, in what became the first Niger House. The new concrete building (still the bottom floor of the present Moyes House) was completed on June 15, funds for which were raised by the Board borrowing against land endowments, the income from which had provided the early scholarships. Work on the property saw the cricket ground ploughed and levelled, the swamp in the Gully Ground drained and the tennis courts and baths planned. The inaugural annual ‘Sports Dinner’ was held; an activity which proved a successful event for many years. Changes continued with new courses being introduced and the school was organised into three form-levels, with the upper school preparing boys for junior university scholarships and Taranaki scholarships. An emphasis was also placed on a range of other examinations and there was the opportunity to commence university degree work. 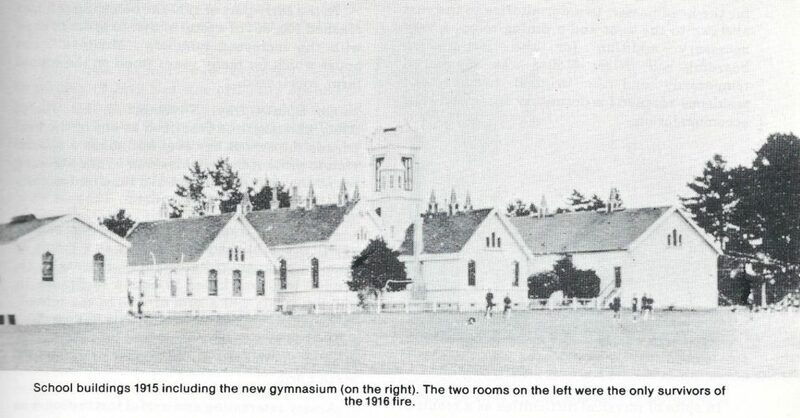 A new gymnasium was designed which was also to serve as a school assembly hall, and completed (it was sited at the Western end of the present Pridham Hall). 1914 was an outstanding year for sports success too: the 1st XV won the triangular tournament, and the shooting team was placed second in the Empire Shooting Competition. The traditions of the school were well-laid – but the shadows of war began to loom. At the end of 1915, 120 of the 600 boys who had passed through the school were overseas serving in the armed forces. By the end of the war the total was 250. Among the first casualties, of which there were 45 in total, was an ex-master Mr V J B Hall who, in the words of the headmaster, was ‘loved’ by all who were taught by him. Further disaster hit the school in 1916. On August 21 at 4.30am fire broke out in the new gymnasium and, fanned by a strong Westerly, not only engulfed the gym, but spread to the main building. Efforts by the fire brigade saved the headmaster’s wooden home adjacent to the boarding house, along with the South and East wings of the main block, the latter of which housed the physics laboratory. (This was known for many years as room 16 and was finally demolished when Ryder Hall and the Alexander Block were completed in 1971.) Much valuable equipment and school records were lost. In 1916 Carrington House was completed and included four dormitories, a new residence for the headmaster and a dining room (presently the boarders’ lounge). Success continued in shooting with the senior team winning both the junior and senior Imperial Challenge Shields. A decade of success in shooting followed. The Weekly Press Shield was competed for nine times for five wins and four seconds including scoring a team possible in 1927. The new school block – now named Pridham Hall – was completed in 1919. The government (as always short of money), approved only the central classrooms, but the towns-folk agitated for funds to complete the building according to the original design. A citizens’ committee was set up and the response to a call for funds was immediate and generous. The amount raised was enough to complete the assembly hall as well as build the West wing and was opened by Sir James Allen, the acting Prime Minister at the time. He was one of the many important visitors to the school, resulting from its country-wide reputation. The school was chosen as the venue for the town on the occasion of the official visit to the region of the Governor General, Lord Jellicoe. Other visitors included Col C W Melville, Sir Ernest Rutherford and His Grace, Archbishop A W Averill. Lord Jellicoe also unveiled the memorial gates, completed in 1923. Members of the Old Boys’ Association, formed in 1912 and revived in 1919 after the war, raised the funds needed to erect the gates to commemorate comrades who gave their lives in that dreadful war. It was their first project and was followed by fund-raising for a new gymnasium which, with a subsidy from the government, was opened in 1924 at a cost of 1924 pounds! It was during this period that a number of traditional sports encounters began. In 1916 the First VX met Te Aute for the first time – winning the game. 1918 saw the school play Auckland Grammar. The team was trounced but turned the tables the next year. In 1923 NPBHS won the Moascar Cup, beating Auckland Grammar, but losing it the next year to Te Aute after a number of challenges played at Pukekura Park. Cricket took a while to get established but by 1919 the top ground was considered the best ground in New Plymouth. The first college match was against Wanganui Collegiate in 1918, and was lost by an innings and 188 runs. 1922 though, was a vintage year for cricket – Wanganui Collegiate was beaten by 10 wickets. But it was academic success for which the school became most renowned. In 1920 Ronald Syme was placed first in the Dominion in the Junior Scholarship Examination. He later became Professor of Ancient History at Oxford being acknowledged with a knighthood and the conferring of the Order of Merit. In 1925 Monty Barak was the first old boy to become a Rhodes Scholar – later becoming a renowned chemist. Two of the current school houses are named after these men. A growing enthusiasm for a multi-course curriculum to cater to the needs of boys led to the official inclusion of a vocational course in the secondary school curriculum, although agriculture had been taught for a number of years. The woodwork block was added in 1928, following the successful amalgamation of the technical school in Liardet St with New Plymouth Boys’ High. This was the first such combined school in the country after special legislation was passed in 1925. A serious fire that year, in the new main block (now Pridham Hall) destroyed the classrooms in the South-Eastern corner and again the racecourse buildings were called into use. Fire struck again in 1936 destroying the gymnasium which was quickly replaced, with old boys’ funds being used to add the stage area to make the building suitable for concerts. The popularity of boarding continued to grow, resulting in a second floor being added to Moyes House, as well as a new residence for the headmaster, and a new wooden dormitory block, Pridham House, being built. All of these were completed in 1937. (Pridham House was demolished in 1981.) The increase in roll required more classrooms and adjacent to Coronation Ave a four-classroom concrete block, the South Block, was constructed. Always cold, it soon was called ‘The Morgue’. The gully area had long been a problem. It was swampy, and full of springs which were dammed forming the ‘Pond’ until it was finally drained and the area cleared, mainly by the boys. A sports ground was envisaged for this site. Serious unemployment at the time, resulting from the depression, led to the formation of the New Plymouth Relief Fund, the committee of which approved the excavation of the gully as its major project. Terraced and grassed, the tennis courts were added and asphalted. This project was completed in 1930 and the Gully Ground was a reality. It was followed soon after by the completion of the swimming baths, the terraces surrounding it being edged with stones carried by a crocodile of boys from the Te Henui River. The use of pools in the river were now officially, at least, no longer needed for swimming. The depression though, continued to have its effect. Roll numbers decreased from 589 to 481, with the boarding roll falling from 207 to 180. Pridham House was closed and not reopened until 1937 when a second storey was added as the roll began to climb again. A new dining room was built with the old one becoming the boarders’ lounge. The library was completed in 1939. Rivalry between the boarding houses led to a house system being introduced for the day boys. East, West and Central Houses along with Carrington, Moyes and Pridham cemented the boys’ attachment to their school, now well-known and respected throughout the country. The Second World War introduced a wave of patriotic enthusiasm. Daily routine initially changed little, but the effects of conflict soon tempered the enthusiasm as increasingly more of the senior boys joined the ranks of the armed forces. They were joined by six of their teachers who left in a ‘heroic farewell’. Fortunately all of them returned. The burden of the war continued to grow. Groups of boys were enlisted to assist on farms and in other local activities, like loading and unloading ships at the port, and running messages – all to assist the war effort. As well, slit-trenches were dug in the gully, blackouts were introduced, and Pridham House was designated as an EPS hospital if ever needed. Over 2000 old boys served in the war itself; 115 were decorated and 227 made the ultimate sacrifice. Mr Moyes, because of ill-health, no doubt exacerbated by the loss of some of ‘his boys’, retired in 1941. The school community was dismayed as he had guided NPBHS to new successes, seemingly annually, all adding to the high reputation it now properly held. He quoted in his farewell letter to the school the words carved on Christopher Wren’s memorial in St Paul’s : “His monument stands not in the graceful lines of churches but in the character and strength of men”. It was that ethos to which he expected the boys to aspire; and that was what the school was (and still is) about. Mr Moore, who was in charge of the technical department, was appointed acting principal for a short time. The woodwork block is named in his honour. Mr GJ McNaught had had a distinguished military career and was appointed headmaster in 1942. Progress did not falter: the new Science block and additions to the South block were opened that year. Niger House was purchased and became the prep school. Considerable reforms in education from 1944 – 1947 added to the need for further changes. The leaving-age was raised to 15, a minimum of 2 years secondary education was determined, and School Certificate was introduced as a leaving qualification for students not intending to pursue a university career. Prescriptions for 40 subjects were written, but a core requirement of English, Social Studies, Mathematics, General Science, Music, Art and PE was determined necessary for all students in the early years of secondary education. University Entrance moved to Form 6 and accrediting was introduced. The first stage of a B.Com was offered at school and a number of budding accountants and lawyers began their careers in 6 Acc. The roll ballooned and, as a result, pressure on facilities increased with class numbers and classrooms bulging. Pressure on the boarding accommodation also increased. At one stage 100 applications were declined with preference being given to students from Taranaki country areas. The school’s reputation in academic achievement and sport, especially rugby and cricket, continued. Cricket saw many old boys selected to represent Taranaki and Central Districts’ teams. The crowning achievement being Martin Donnelly’s double century at Lords while playing for New Zealand. Rugby also enjoyed success. The forties saw the 1st XV win 28 of the 37 college matches, and losing only four. The golden years followed. In the fifties the school was undefeated in college matches for six years, playing 27 games. Other sports to achieve distinction from time to time in those post-war years included gymnastics, hockey, life-saving, rowing, steeplechase, swimming, football and tennis. Other successes included the introduction of the music festival. The first combined GHS and BHS production was held in what was the Opera House, in 1951. Heating systems were introduced to the main school, the woodwork block extended, the Moyes Cricket pavilion built. Niger House changed its status from a prep school, closed in 1956, to a boarding house for third-formers. But the most profound effect on the school was the retirement of long serving teachers who, collectively, had helped build the ethos of the school. These included Mr CG Bottrill, Mr GF Bertrand, Mr AW Diprose, Mr HC Gatland, and Mr AJ Papps, all of whom had served thirty years or more. Teachers with thirty or more years of service are recognized on an honours board in the assembly hall. Post war baby-boomers swelled NZ secondary-school rolls. As a result, temporary classrooms, called prefabs, started to appear. New secondary schools were opened in Waitara, Inglewood, Okato, and in New Plymouth, Francis Douglas Memorial College and finally Spotswood College were established introducing a new era of choice. NPBHS held the traditional focus. The 75th Jubilee, a resounding success, held Easter 1957 (with all boys in attendance), readily demonstrated this with traditional sports fixtures including the Hansard Cup athletic sports, a full battalion parade, and importantly the unveiling of the Memorial Shrine. This shrine, with its stained-glass window, was a gift from the next of kin of the fallen, the names of whom are etched on the shrine. This has been the centre of ANZAC commemorations every year since. The memorial block would not have been possible without the financial support of the old boys. Mr JS Webster was appointed the fourth headmaster in 1958. He demanded high standards, held to the old traditions and launched a period of major change in the fabric of the school, overseeing the building of the caretaker’s residence, extending the memorial block, establishing the McNaught field and tennis courts and the new football fields on the old piggery site, later named Webster Field in his honour. In the hostel, accommodation was increased with an additional wing being added to Carrington House, extensive renovation of the other Houses, and the Farmhouse in Pendarves Street being converted to accommodate third-form boys. Mr Webster was determined to keep boarding fees as low as possible, for as long as possible, and numbers in boarding exceeded 350. He continued, in contrast to the situation in many other boys schools, to accept all applicants and not concentrate on only high achievers. This ethos of inclusion was heightened by new teachers employed, some from overseas, and many who had had the levelling experience of war service. During the sixties the school continued to serve its community well with success continuing in both sports and academic areas. Notable was the Rhodes Scholarship awarded to Bill Wakelin, the school’s third, following Monty Barack (1925) and G Crowley Weston (1938). Also of note was a visit from Sir Ronald Syme, professor of Ancient History at Oxford and, in rowing, the winning of the Maadi Cup. The ripples of social change in the community required new directions for the school and many of the old traditions began to be questioned. Courses like Agriculture were dropped from the curriculum, Victoria University discontinued the authority for schools to teach degree courses and 6 Accounting ceased. Lack of money, with the government concentrating on building new schools throughout the country, resulted in poor maintenance and many of the buildings became dowdy. In 1967 Mr Webster was tragically killed in a car accident and Mr WE Alexander, who had been acting headmaster, while Mr Webster was president of the PPTA and living in Wellington, was appointed headmaster. An old boy, who had grown up with the changing traditions of the school, having taught for nearly thirty years, and who had served in the war, sensed change was needed and introduced a number of new initiatives. An example of this desire to try out new ideas was the very successful Chalet Classroom experience for fourth-form boys where each class spent a week of out-door activities based on Mt. Taranaki. Further new initiatives/trials included: Martin Donnelly being the guest speaker at the reintroduced Sports Dinner, having girls from GHS join some senior science classes (soon discontinued because of lack of MOE funding), and the introduction of the successful Arts Festival which included House drama, debating and oratory accompanied by displays of art. In addition a number of field trips supporting aspects of the curriculum were held and an outdoor education programme was organised for those who had had UE accredited, and team-teaching in Science was trialled. Night-classes, mostly taught in the old technical school in Liardet Street, which had started in the 1950s, had grown considerably in scope and number. Qualifications were offered in trades, Commerce, and Accounting, along with a range of evening classes for adults in UE and SC subjects. As well, there was a variety of hobby classes. In 1971 the Taranaki Polytechnic was born with the good wishes of all. Mr AN Wilson, a popular teacher of Science at NPBHS, was appointed its principal. Mr J Clouston who had steered the progress to its opening, became deputy headmaster of the school. Overcrowding and poor maintenance had remained problems, although relief was on its way. At the end of the year the annual prize-giving was held in the Opera House for the last time. Mr Alexander retired and Mr G Cramond was appointed Headmaster. Early in his first year, the Alexander Block, with two labs, the staffroom and four classrooms, was completed along with the new assembly hall with its impressive chapel window and administrative offices, resulting in the school’s centre shifting from the old hall – renamed Pridham Hall – to the new building. The Alexander Block and Hall were opened by the Prime Minister, Mr J. Marshall. The change allowed the demolition of rooms 14, 15 and 16, the remnants of the original wooden school and two prefab labs. It was the time of the Vietnam War; community expectations were changing along with social mores of the time. Schools and standards they instilled were under question and pressure. Defiantly, hair grew longer, authority was questioned, and the comfortable order of previous years waned. Academic performance also slipped. The value of a boarding-school education lost some of its appeal and, as a result of this and a number of other factors, the boarding roll dropped. The Farm House was closed in 1972, Niger House in 1973 and Pridham House was no longer used after 1977. Both Niger and Pridham houses were later demolished as new requirements for fire safety in hostels meant that, with the expense of bringing them up to the new code, their continued use was untenable. Changes were needed to make the school less hierarchical, more inclusive and understanding. Deans and a Guidance Counsellor were appointed, the uniform changed, a new House structure was introduced along with vertical form groups instead of the old horizontal forms. The traditional course structure, based on rigid streaming, was replaced by a broad general course of core subjects, in which boys were placed in three bands according to their ability, with limited option choices. This provided a foundation from which courses could be chosen in Form 5, the SC year. Study periods were also introduced for senior boys along with a work experience class which allowed some boys to work with local employers for a full day each week. Despite falling numbers, sports remained strong throughout the decade. The 1st XV lost only two matches in seven years of college rugby, including the winning of the Moascar Cup in 1972, forty-seven years after it was last held. Three old boys from this period were later selected as All Blacks. (A total of 24 have been chosen over the years; seven appointed captain). Cricket continued to occupy the ‘Top Ground’ and while these two traditional sports maintained their dominance, soccer, hockey, badminton, and basketball, introduced in 1963, had their successes too. One of the most important changes was the decision to replace the New Plymouth High Schools’ Board, which had jurisdiction over all the state secondary schools in New Plymouth, and form separate Boards of Governors for each of the schools. The New Plymouth Boys’ High School Board met for the first time in July 1977. The following year Mr Cramond resigned and Mr TT Ryder was appointed, taking up the reins in 1979. He quickly began to vigorously restore the school’s ethos and values. He demanded high standards of behaviour, clear expectations of performance and quickly understood the important role which boarding and the hostel played in developing the special character of the school. Pridham House was demolished, boarders who had been separated into junior and senior groups were again placed in the restored Carrington and Moyes Hostels. School buildings were also a focus of attention. The ‘Old Block’ (including the assembly hall) was named Pridham Hall, renovation of the science blocks began, and determined lobbying led to a new Biology wing being built in 1980 on the old Pridham site. Plans for a new gymnasium were proposed, and a new tuck-shop was built. Curriculum changes allowed fourth-form (Yr. 10) boys to take six subjects, languages were encouraged, Latin retained, Maori and Japanese introduced, and the form six (Yr. 12) course expanded to encourage non-academic boys to remain at school. Music also had a resurgence. The houses were renamed to celebrate distinguished old boys: Syme, Barack, Donnelly, and Hatherly. John Hatherly had spent his life, as boy and man at the school, head boy in 1937, forty years a teacher, and for many years, senior hostel master. Boarders who had been spread alphabetically through all the houses were now all placed in Hatherly House while the day-boys were spread alphabetically through the other three. Plans were also afoot to celebrate the Centennial during which the foundation-stone for the new gymnasium was laid by the Governor-General Sir David Beattie. Over $15,000 was raised by the boys which allowed a viewing gallery to be included in its design. The Top Ground and Webster Field were resown, the school painted, and a new library planned. The headmaster was determined that the school should be shown in its best light and celebrations attended by over 2000 old boys were most successful, despite Cyclone Bernie rocking the opening night. To mark the occasion a Centennial Trust was launched and raised over $100,000. Later this was merged with other trusts ensuring an annual grant to the school of considerable size. The Centennial marked the resurgence of both the school and hostel. The hostel roll had dropped to 117 and was in line for closure. During this period boarding schools generally lost their appeal and a number of schools closed their boarding establishments. But that wasn’t the mood of the NPBHS headmaster or board. Operating deficits were addressed, old buildings were demolished, and a new laundry built. Social conditions changed, meetings with parents and prospective parents were held, with many led by old boys who cared deeply for the school, and good staff were appointed, all of which turned the tide and by 1987 the roll had risen to 179. School organisation also changed in the 1980s to address the changing learning needs of the boys, brought about by the increasing number remaining at school in the senior years but not intending to pursue an academic path. In the junior school the upper band boys were all required to study a language – Latin, French, Japanese or Maori – and special classes were organised for those with learning difficulties. The curriculum was expanded to include Home Economics, Horticulture, Music as a full subject, and Business Studies. Woodwork, Metalwork, Technical Drawing and Art remained popular. In the senior school Construction, Engineering, Legal Studies, Economics, Horticulture, Classics, and Phys-Ed (the latter three becoming Scholarship courses) were added and boys were given the freedom to choose options rather than follow prescribed courses. Teachers were appraised and schemes of work monitored. These, together with other initiatives, saw external examination results improve dramatically throughout the decade. In 1978 pass-rates in School Certificate Mathematics, English and Science were less than 50%. By 1994 they were 66%, 74%, and 61% respectively, and furthermore, sixteen boys collectively had 35 scores above 90%. Bursary rates too, improved over that period from 35% to 80%. Scholarship results improved dramatically too, particularly with the introduction of single-subject scholarships in 1990. Moreover, boys stayed longer at school and the retention rate increased substantially – in 1979 the Form 7 roll was 40 and by 1995 it had grown to 116. Other changes saw UE moved to the seventh form (Year 13) in 1986, leaving 6FC the major qualification in the sixth form (Year 12). The connections to the maori community were also strengthened: the Maori Language classroom (Kokiri Te Reo) was added, aspects of tikanga were included in formal school activities, and the school haka rewritten and performed (with passion) on appropriate occasions by all boys. The fabric of the school also improved in the Ryder years: a new swimming pool was added in 1986 by carving out a new site in the hillside adjacent to the old pool, the new library was opened, and the new Science quad landscaped. In that decade over $5m was spent by the government on various projects including creating a senior physics complex , upgrading the administration area, remodelling the Woodwork block, upgrading the Music suite and Memorial block, increasing the size of the Art block, and establishing a Student Services Centre housing the counsellor, transition teacher and careers advisor. Two computer-rooms, funded entirely by the school, were set up in the South Block, now called the Cramond Wing. Eight prefabs over-looking Webster field, needed to house the growing roll and expanded curriculum, were built (the roll had grown to 1150 by 1992). In 1993 Pridham Hall was structurally strengthened to meet the new earthquake codes. Fully renovated, it was opened by the Minister of Education, Dr Lockwood Smith. Much attention was also given to the landscaping and up-keep of the grounds. Flower-beds were added, seats were erected on the Gully terraces, kikuyu cleared from the top field, cricket practice nets built, Webster and McNaught fields levelled and drained, and a new pavilion built on the Gully Ground in 1994. Called the Fookes Pavilion, this housed showering and changing facilities. The original pavilion, the first headmaster’s house, which had been modified and shifted to the Gully, was burned down in 1963. Additions to the new assembly hall included a number of honours boards to celebrate high achievers in all aspects of school life, and photos of many were displayed in the main corridor. Pou-pou, carved by a maori old boy were erected on each side of the stage, and a museum of artifacts, giving substance to the school’s history, was added to the chapel area of the hall. This has been named the Ryder Hall in recognition of the service that Tom gave to the school. His era, marked by almost continual enhancement of the school, spanned a time of increasing social change in the wider community, including: drug and alcohol abuse, changes to discipline practices – caning (which had decreased over the years and was used only by senior staff as a last resort), was abolished by law in 1990, the change in education management with the introduction of Tomorrow’s Schools and school appraisals by the Education Review Office, the first of which NPBHS passed with flying colours. 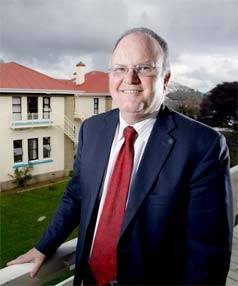 Lyal French-Wright was appointed Headmaster in 1995. 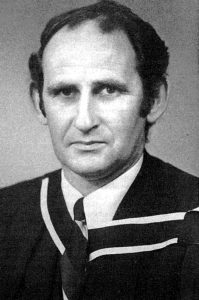 He settled in quickly and imposed his style of leadership on the school, maintaining and enhancing its fine reputation which, in his eyes, meant stressing high standards of behaviour and encouraging students to take responsibility for their actions. He affirmed the holistic approach to education and his premise was that ‘what is best for the boys’ should be the guideline for all actions. He worked long hours, encouraged the best from his staff – relating easily to them and students, and re-invigorated the Old Boys’ network throughout the country. The roll rose to 1300 and the hostel roll to 220. A new hostel building, now called Carroll House, housing 45 boys, was opened by the former prime minister, Jim Bolger, in 1998. The IT age was rapidly expanding; a response was needed and in 1997 the school was completely networked and two new computer rooms, built above the library, were opened by the minister of technology, Maurice Williamson. Half the cost, over $500,000, was raised by the school. Amenities continued to expand and the Devon Hotel Park all-weather hockey ground, on a leased section of Webster Field, was completed – lights were added later. Two new prefabs were erected along with an additional Technical Drawing room (1998) and then further Economics and Art rooms. The ad hoc nature of the growth of the campus at NPBHS (it frightened the government) led to the completion of a ten-year plan. Sports were enhanced with additional college fixtures being introduced along with the super-eight competition among boys’ schools in the country. The Fookes Pavilion was extended adding squash courts and other facilities. Also a recording studio was added to the Music room in 2003. Moyes House was strengthened in 2005 and the Sulzberger Cricket Centre was added to the site opposite Webster Field at no cost to the school. The roll by 2004 was 1321 and the Ministry finally approved the ‘Grand Plan’ which saw Cramond wing demolished and rebuilt, and the adjacent Alexander Block refurbished and completed in 2007 at a cost of $5million, of which the school contributed $1million. As in previous decades the changes, additions and refurbishment of buildings was only part of the story. Social changes continued to impinge on school life, expectations of schools and the needs of students who were staying at school longer meant that old systems of measuring attainment in the senior years, despite modifications, came under the national spotlight. Far-reaching new national systems, announced in 1995, were to be progressively introduced. School Certificate and University Entrance examinations were to be replaced by Achievement Standards and Unit Standards which accumulated credits counting towards Levels 1, 2 and 3 of National Certificates in Years 10, 11, 12 and 13.The School trialled the system with 100 other schools: in 2001 NCEA Level 1 was launched to replace SC; in 2002 Level 2 replaced 6FC and in 2004 Level 3 replaced Bursary, all of which included a greater range of subjects, many vocational. Many of the credits could be earned by moderated internal assessment, some by Unit Standards, and others by examination thus catering for a greater range of student interests and abilities. Merit and excellence awards could still be earned and Scholarship Examinations were retained for academic students in Year 13. In 2005 16 boys won scholarships in 24 subjects. Importantly the new qualification system also allowed students to gain credits through National Certificate ‘apprentice-like’ courses organised through Star and Gateway programmes, thus beginning a trade qualification while still at school. NPBHS, encouraged by the headmaster, continued to provide energy and resources into extracurricular activities – always a hallmark of the school. The more traditional activities which were still strong were enhanced by the Super Eight competition. Others such as Canoe Polo, Triathlon, Golf, Inline Hockey, Mountain Biking, Motor Cross, Navigational Sport, Orienteering, Skiing and Snowboarding, Surfing, Indoor Bowls, Squash, Volleyball, Yachting and Wakarama, many with strong support from Sport Taranaki, professional coaches employed by the school, and volunteers, were all recorded in the 2008 Taranakian. Outdoor Education still was a focus in Year 9 and in Year 10: all students attended TOPEC, which provides rock-climbing, abseiling, white-water rafting and winter snow-caving. Drama, music, and public speaking were all sustained and enhanced. Leadership among the boys was also strengthened by the re-introduction of prefects, in addition to group leaders, in 2008. The annual Awards Dinner, now entitled the Leavers’ Dinner, continued, and replaced the earlier Sports Dinner, extending the celebration of successes in sport to cultural groups and performing artist of the year. In Lyal French-Wright’s last address before his departure, in 2008, he said, “I am sure that all of you can look in the mirror and be proud of the person that looks back. I congratulate you all for making NPBHS a better place for your being there”. The new block has been named in his honour and the library is now called the Cramond Library. 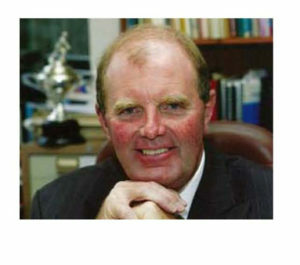 After a brief period Michael McMenamin was appointed the eighth Headmaster of the school in 2009. A previous Deputy, he knew the school well. In his first end-of-year address he said that to achieve the mission of the school, to prepare confident, well-educated young men, “…we must hold onto and promote traditional values such as integrity and respect”. He did this by getting to know the boys and taking a keen interest in their academic and sporting goals. Music and cultural activities and their promotion, were a special interest of his. The school entered music, debating and oratory groups in the Super Eight Cultural Festival in Rotorua. Plans for a new block to house Languages and Home Economics were drawn up and was to be constructed at the end of the Memorial Block. It was completed in 2011 and led to the removal of a number of the prefabs adjacent to the Horticultural area. Mr McMenamin also established a Millennium fund which was subscribed to by a number of old boys, and introduced the Alumni Meriti Award for distinguished old boys. Progress was halted by the regulations which were included in new building standards following the Christchurch earthquake. Many hostel buildings were well below the standards imposed and as a result Carrington House, which had been home for boys for nearly a hundred years, was demolished. Other buildings will require extensive repairs. Necessary work will fall on the plate of the new headmaster. Mr McMenamin retired in 2014 and Mr Paul Veric, the second Old Boy to be appointed headmaster, took over in May 2015.